Status: Deceased; Active 1965-1982. Born: 1939-10-02. Died: 2008-12-09. Spaceflights: 1 . Total time in space: 17.73 days. Birth Place: Moscow. Graduated from Kharkov Military Engineering High School, 1962. Received the candidate of technical sciences degree, 1974. Doctorate degree of technical sciences, 1991. Soviet Air Force. Parachutist and engineer. Cosmonaut training November 1965 - December 1967. Deputy Director of Flight activities within the Gagarin Cosmonaut Training Center. 1989 named Major General and First Deputy Chief of Gagarin Cosmonaut Training Center. 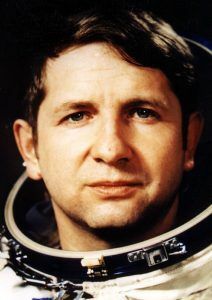 Retired in May 2000, continuing scientific consulting work with the Gagarin Cosmonaut Training Center. Family: Cosmonaut. Country: Russia. Flights: Soyuz 21, Soyuz 23, Soyuz 24, TKS-1, Salyut 7/TKS-2. Agency: VVS. Bibliography: 4452, 5435. 1939 October 2 - . Birth of Yuri Nikolayevich Glazkov - . Nation: Russia. Related Persons: Glazkov. Russian engineer cosmonaut 1965-1982. 1 spaceflight, 17.7 days in space. Flew to orbit on Soyuz 24 (1977)..
1977 February 25 - . Landing of Soyuz 24 - . Return Crew: Glazkov, Gorbatko. Nation: Russia. Related Persons: Glazkov, Gorbatko. Program: Almaz. Flight: Soyuz 24. Soyuz 24 landed at 09:38 GMT, 37 km NE pf Arkalyk..
2008 December 9 - . Death of Yuri Nikolayevich Glazkov - . Nation: Russia. Related Persons: Glazkov. Russian engineer cosmonaut 1965-1982. 1 spaceflight, 17.7 days in space. Flew to orbit on Soyuz 24 (1977)..